Michael Peter Mitchell, known to many as Mike, was born on the 27th of February 1944 in Fulham, London, the son of Les and Christine Mitchell. He grew up alongside sister Peggy and brother Alan. From the age of 11, Mike attended Wandsworth School. He was a keen musician, and played trumpet and trombone at school and continued to play in various brass bands in London, including the Fulham Brass Band and Watney’s Silver Band. Mike is seen in photo below with some of his school mates including Brian Sawyer & Fred Shaub who are part of our choir group, playing in a show band. The image was taken in the quadrant of the new school in 1960/61. After completing secondary education, Mike began training as a teacher at St Mark and St John’s Teacher Training College. Mike went onto lead a very active life, he married Cynthia and had 3 children, Andy, Liz and Hannah. He had a very happy and contented life with his family and friends. Mike sadly slipped away after losing his fight against stomach cancer. We are grateful to Mike’s daughter Liz for informing us about her Dad’s passing. 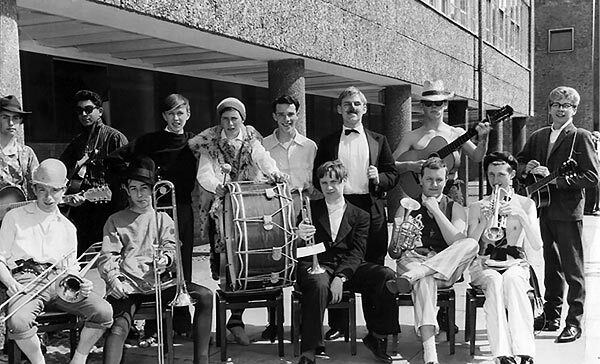 From the photo taken in 1961 it is obvious that Mike was a true Wandsworthian and we would welcome more information on his band. Image taken in Quad near main Classroom Block. Front row left to right: Michael Mitchell, Fred Shaub, can’t remember name but known as Taff, David Munden, Brian Sawyer. Back row left to Right: Unknown, Unknown, Derek Richards, Unknown, Unknown, John Lally (Head Boy),Unknown, Unknown.